You live in a fast-paced world where there are clocks everywhere. You have deadlines. You have bills that have to be paid by a certain date, or else. And so, we see you rushing to get as much done as you possibly can in the shortest amount of time. Of course, we are only speaking to the vast majority of you. And so if you don’t find yourself in this group that we are speaking to, you will still find something in this transmission that is for you. When you have something to do, whether it is something you really want to do, or it is something you just have to do, we suggest that you start practicing this slowing down technique that we have been utilizing for our entire existence in the ninth dimension. We want you to savor what you are eating and to give your full attention to what you are doing, or even what you are watching. We see so many of you multi-tasking, instead of stopping long enough to enjoy what it is that is right in front of you and that deserves your complete and undivided attention. Now, generally speaking, when you find something that you really enjoy doing, you tend to get lost in it. 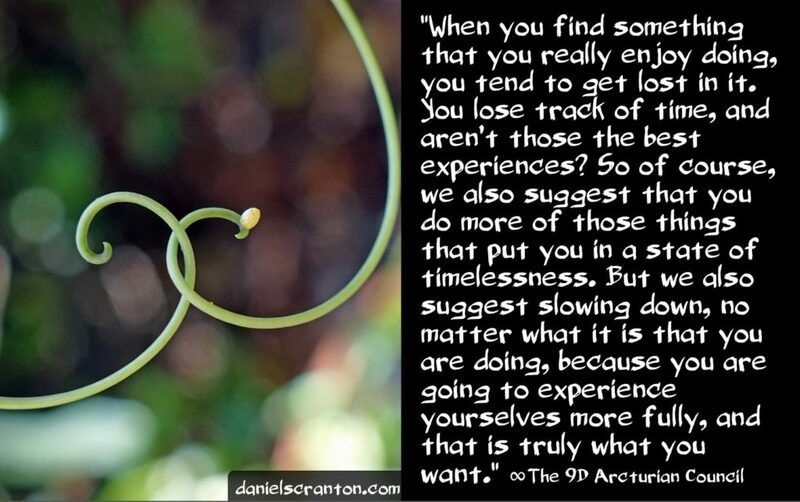 You lose track of time, and aren’t those the best experiences? So of course, we also suggest that you do more of those things that put you in a state of timelessness. But we also suggest slowing down, no matter what it is that you are doing, because you are going to experience yourselves more fully, and that is truly what you want. You want to be more of you, and you want to bring more of you to whatever it is you are doing in the moment, regardless of whether it’s something that you consider to be important. Start this slowing down practice with one thing, and then add something else, and then add something else, until you find yourself relaxed and enjoying every little thing that you do.